More than 5 million people in 2.1 million low-income families use the Housing Choice Voucher program to help pay for housing that they find in the private market. Expanding and improving the program could boost poor children’s prospects: studies show that these vouchers reduce homelessness and that living in stable housing is linked to better long-term educational and health achievement among poor children. But the Housing Choice Voucher program falls short in two important ways. First, its reach is limited. 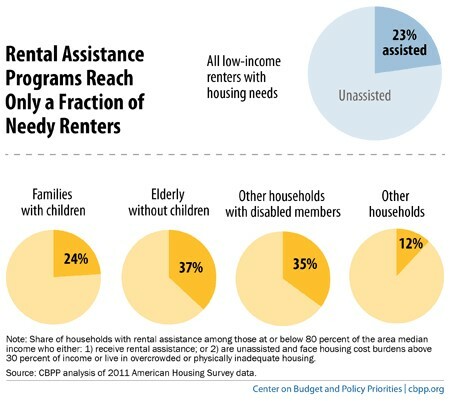 Only about one in four low-income families eligible for rental assistance receives it (see chart). Second, families often have a difficult time in using their vouchers to move to significantly less-poor neighborhoods—areas where there are more jobs, better schools, and/or less crime. In congressional testimony last month, Center on Budget and Policy Priorities President Robert Greenstein recommended ways to increase the voucher program’s effectiveness and efficiency. families to use their vouchers in high-opportunity areas. Encouraging the formation of consortia of PHAs in a geographic area. HUD should revise rules to reduce administrative burdens and provide incentives for agencies that form consortia. If HUD enters into a single voucher funding contract with the agencies in a consortium, “portability” barriers would be eliminated and families could use their vouchers to move seamlessly within the entire service area. Ceasing to pay for inefficiency. Under current funding formulas, HUD provides an incentive for agencies to remain small rather than to form consortia. We estimate the program could save about $40 million per year just by eliminating the higher per-voucher fee that agencies receive if they administer 600 or fewer vouchers. Placing poor performing agencies on a shorter leash. HUD has the authority to take over administration of poorly performing programs and consolidate them with a willing, well-managed PHA. HUD could strengthen its performance assessment tools and use available remedies in response to poor performance to foster the formation of larger, more effective and efficient local programs. It’s refreshing to hear these recommendations. The borough of Pottstown is one of two municipalities in Montgomery County, PA that carry the weight of the predominance of voucher housing. Extremely low home values, negligent income investors, historically ineffective codes and policing on the local level and, zero or minimal response to requests from Voucher Housing when problems arise with their voucher holders has led to housing conditions that put their inhabitants at great risk and has also compromised the safety and health of our entire community. Unable to attract homeowners or new businesses, under these conditions…our clock is ticking. Yet, many voucher holder choose to live here because of the lax enforcement. Gangs and drug dealers are enabled to find opportunity to move into voucher housing with young single mothers while they ply their trade on our streets. This winter, there have been drug related shootings and cop beatings, increasing violence and personal property crimes as addicts find ways to support their addictions in a very low-opportunity community. The answers aren’t easy and yet, we haven’t much time to spare.